Today, we’ll look at John Stewart, one of Earth’s several Green Lanterns. John first appeared in “Green Lantern” (vol. 2) #87 in December 1971/January 1972. He was created by Dennis O’Neil and Neal Adams. Stewart is a former US Marine from Detroit. He was originally selected by the Guardians of Oa as a secondary Green Lantern of Earth. Stewart served as such for years. Outside of the DCU, Stewart was also the Green Lantern of choice for the 2000s “DC Super Friends” comic. 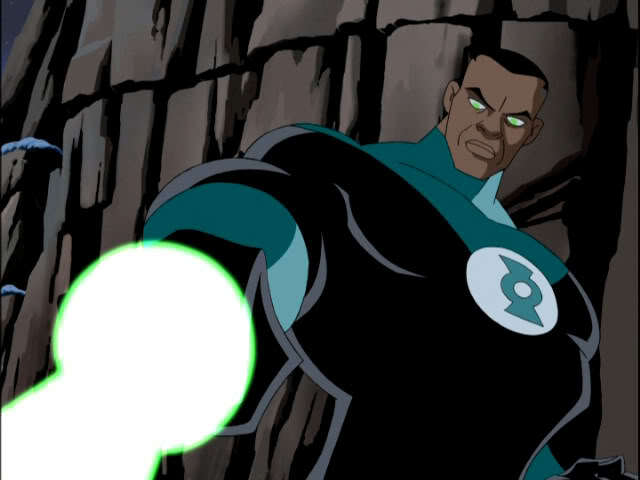 In 2001, John Stewart was chosen (over Hal Jordan or then-current-GL Kyle Rayner) as the Green Lantern for the “Justice League” animated series. At the time, there was some online controversy over the choice, as various fans of Kyle (and some of Hal) felt slighted by the decision. Unfortunately, some of the complaints online at the time came off as quite nasty. Some fans claimed the producers were “just being PC,” and only chose Stewart because he’s African-American. This ignored that Stewart’s a long-running character and Green Lantern in his own right. Stewart has also made appearances in “Young Justice” and “Static Shock.” Ironically, John never appeared in “Green Lantern: The Animated Series.” However, he’s mentioned as a replacement Green Lantern of Earth, which led to a brief “Daily Show” joke.